Oil Smoke Stop reduces the oil consumption of gasoline and diesel engines via the piston rings and valve guides. It prevents blue smoke and oil mist and acts against the loss in viscosity in motor oils. Oil Smoke Stop increases the compression ratio and reduces engine noise. Provides extra protection in engines with high levels of wear. Extends the service life of catalytic converters. For all gasoline and diesel engines. Compatible with all commercially available motor oils. Not suitable for use in motorbikes with wet clutches. 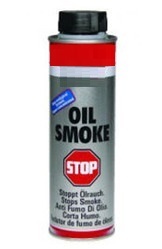 One 300 ml can of Oil Smoke Stop is sufficient for 4 – 6 liters of motor oil. Do not add more than 10 %. Add to the warm motor oil during every oil change and between oil changes if oil consumption is very high.